Duke University Press, 2014, 152 pages. This is a book about choice. That reader who chooses non-acquiescence, chooses learning and living, who is willing to abduct one’s self from home (63) and be self-surpassing, that is the reader Brian Massumi addresses himself to. The one who, instead, seeks comfort in repeating the stale ideas of their inheritance — in Massumi’s delightful phrase, borrowed from Jean Oury, the “normopath” (70) — well, the normopath is also cordially invited, but is welcome to leave the playground at any time. Things do get a bit rough in there (it is not always easy to tell a nip from a bite), and all that is at stake in play is life itself. Brian Massumi, in What Animals Teach Us About Politics, makes a case for us to claim our essential animality in order to ascend to an ethic that is still truly (which is not to say, exclusively) human: vital, creative, and expansive. He builds his argument as if laying a very elaborate trap. (I want to say that it is a harmless, non-violent trap, but that would be a lie. The price of being snared is having to rethink everything.) The argument begins with a revisiting of instinct — what for the Cartesian humanist remains the hard limit to animal expressivity — through an analysis of animal play. [i] Massumi’s choice to devote so much philosophical energy, not to mention space in this slim book, to play is a clever and strategic one: he is playing along (but only as a ludic gesture, denoting what it is not) with his most skeptical readers: since you refuse to believe animals have creativity, fine, I’ll be a sport and begin with what we can agree on: that (some) animals roll about. Enter here — via one of the book’s primary interlocutors, anthropologist Gregory Bateson — a couple of wolf cubs in a play fight. When one wolf cub bites another in play, he says in his bite, “this is not a bite, this is a nip (this is not combat, this is play).” The ludic gesture of play can never be the same as what it would denote. If the nip is too much like its analogue, the bite, the would-be players turn into adversaries. By the same token, if the nip is too much like a nip, there would be no play either, just boredom and indifference. Animal play, in other words, is a play upon difference, and from this crucial point Massumi (again, via Bateson) extracts two further animal capacities: aesthetics and tense. Animal play is metacommunicational. It is reflexive, necessarily commenting upon what it is doing: “this is not a bite, this is a nip.” For those who might object, saying that animals don’t “comment on” things because they can’t talk, Massumi does mere talking one better, arguing that animals in play say what they must say through style, through the “–esqueness” of their ludic gesture (9). It is in a certain jauntiness, a flick of the paw, a spring in the step, a flash in the eye, that the wolf cub says, “this thing that I’m doing does not actually denote what it must appear to denote in order to be felicitous.” The animal has style (a “surplus value of life,” an “aesthetic yield”) and therefore also abstraction and tense. In saying what she says she makes reference to something that is not present — combat — but makes it present as the very conditional possibility that makes the play worth playing at all. The attribution of instinct as the hard limit to animal expressivity says that non-human animals can, at best, perceive present objects such that a genetic memory is triggered, activating an already available “reflex” response. The animal lives only in the present, and only as conditioned by an inherited past. Based, however, on the animal capacity for abstraction and the ability to yield an aesthetic surplus as expressed in style, Massumi — now with turns to Henri Bergson — redefines instinct as “lived intuition” (31-32), “a way of thinking, one with doing,” or “the gestured expression of the as-yet inexpressible.” A key term here and throughout the book is the “supernormal,” understood as “surpassing the given.” The play of the wolf cubs surpasses the given: it depends and feeds upon what does not exist but could; it responds not just to objects but to qualities (-esqueness), and what they would denote. What does it mean to be able to be moved by others, and move others too, into the heart of a moment that is yet-to-be? As Massumi points out, we call that capacity sympathy. Massumi’s relationship to difference in this book is challenging. To normopaths it will appear contradictory. To those already critical of human supremacy (who, of course, might still be normopaths), it might appear insufficiently radical, and even retrograde. Let me explain. Having established what animals can think and do (analogy, style, metacommunication, abstraction, surpassing the given) and linking all of this to sympathy, which — through its movement of another in “immanent counterpoint” — is the heart of language, Massumi argues that all that is special to the human — specifically, language and writing — is not what separates us from animals, but is a “pure” and vital expression of our animality (59). It is through this argument that Massumi places us (and all of life, for that matter, every insect, plant, and atom) on the animal continuum which, as he puts it, “does not erase what is different about the human but respects that difference while bringing it to a new expression…” (3, italics mine). It would be fair to ask, then: what is the point? Don’t we already know that humans share traits with non-humans, but also that we are, as Massumi often asserts, the “highest” and the “most” of the capacities we keenly value? And isn’t it questionable to assert a unified humanness that shares a “difference” from all else even as he chides us on our species vanity? I admit that I never quite came around to Massumi’s language of most, purest, and highest, but I do understand why the focus on difference — the simultaneous adoption of and distance from, or its mutual inclusion — is so crucial to this project. Discourse concerning animals is polarized and polarizing: some people are uncomfortable admitting to difference, while others seize upon difference as a justification for violence and atrocity. When the latter group perceives intellectual failures of the first, that further invalidates for them anything the first group might have to say against human exceptionalism. But as Massumi points out — and this is his broadside — those, both, are the politics of petty minds, a human politics out of touch with its own vitality and the vitality of the wide world, in which differences are not differences of kind and essence but differences only of degree and tendency; differences not of exclusion and separation, but of mutual inclusion which, Massumi says, “knows nothing of exclusive oppositions” (46). An animal politics — according to Proposition 10 of Supplement 1 (the titles themselves are a great ludic gesture of gravitas) — always affirms a logic of the included middle (46). It is only a human politics, soullessly rent from the sympathy, verve, and supernormality afforded to it by its animality, that cannot see that things are “mixed without getting mixed up,” (47) cannot see how things are “fused without getting confused” (6). Wake up and be an animal, Massumi says: see the world for all that it is and can be. Difference exists and also does not. It is always a “gesturally fresh question” (34), depending on what it is that matters to you. And what is it that matters to us? What do we choose to do with the vital capacities that are afforded us by our animality? Things threaten to get dark here, in the most critical section of the book, “Supplement 2: The Zoo-ology of Play,” but to allow that to happen would be an all-too human move. Human politics denounce, premised as it is on the lifeless lie of oppositions. Animal politics, on the other hand, finds a way to “leverage creativity. . . even out of the most denunciation-worthy situations” (74). The zoo is one such situation, where children are taken for fun to witness free and vital beings trapped in enclosures. We know the horror of this, whether we admit it or not, and we can be sure our hapless charges do too. But — as Massumi puts it in one of the great lines of this book — “adults, hungry for an entertaining break from the hard work of raising the next generation of normopaths” (73) histrionically insist on the fun of this sovereign madness, obscuring with crass anthropomorphic sentimentality (the hetero animal “families,” the wholesome humanoid names) the radical sympathy that is and should be ours instead: the ability to affect and be affected, to move and be moved. What is an animal politics to do, what creativity can be leveraged in such a scene? Well, the child is in-tigered, playing “tigritude” (84). The writer writes (86) like a “rat flicks its tail” (55). Because we choose to, because we must, we find our supernormality again. [i] See also Graeber, David. 2014. “What’s the Point If We Can’t Have Fun?” The Baffler (24). Naisargi Dave is an Associate Professor of Anthropology at the University of Toronto. She is currently completing a book on the moral entanglements of humans and animals in India. 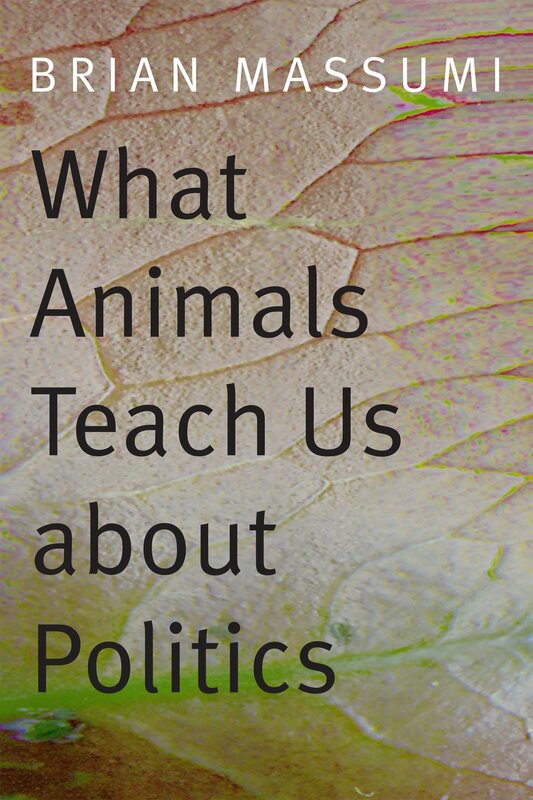 Dave N. Brian Massumi’s “What Animals Teach Us About Politics”. Somatosphere. 2015. Available at: http://somatosphere.net/2015/brian-massumis-what-animals-teach-us-about-politics.html/. Accessed April 24, 2019. Dave, Naisargi. 2015. Brian Massumi’s “What Animals Teach Us About Politics”. Somatosphere. http://somatosphere.net/2015/brian-massumis-what-animals-teach-us-about-politics.html/ (accessed April 24, 2019).